Passage Series. Commissioned by Kristin College, Albany. The narrative work was inspired by Ann Salmond's Two Worlds and references the first layers of two cultures meeting - stone age Pacific and industrial age European. There are fourteen 'moon' slivers; curved vertical panels, representing half a moon cycle. 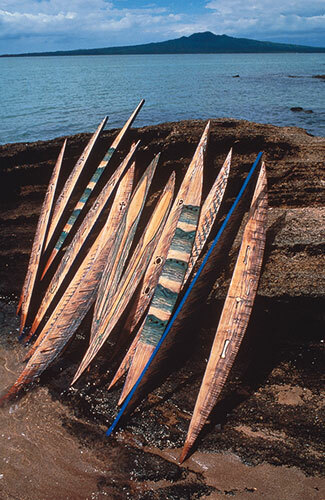 Seven panels, represent each culture to address a possible balance and perspective to those initial meetings and record aspects of journey and arrival. 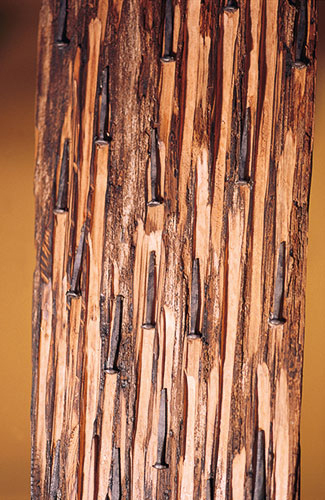 The reverse sides of the embossed panels are deeply cut and chain-sawn, one inlaid with handmade nails, others inlaid with slivers of poenamu and bone fragments. Other panel references include language with the inlaying of bronze letters, while its corresponding panel has the letters removed. I carved references to Spöring's engravings made during Cook's expedition of land seen from the sea. The panels are inlaid with coins over the land forms, a reference to port holes and the land as a commodity. Dimensions: 14 suspended panels, each Height 2000mm x Width 250mm x Depth 25mm. Materials: Salvaged Kauri, pounamu, nails, bones, cast bronze letters, coins and acrylic paint.